Political chaos, record high unemployment and weak growth after a historic recession. Those are just a handful of Brazil's laundry list of problems in 2017. Over 14 million Brazilians are out of work and the unemployment rate hit a new record of 13.6%, according to figures published this week. Before the economic crisis, it was half that at 6.5%. The one good news is that Brazil's longest recession in history has finally ended. Brazil's economy stopped contracting and eked out 1% growth at the start the year, compared to the previous quarter. But that won't change life for many in Brazil. Brazil's job outlook is worsening as President Michel Temer is embroiled in new corruption allegations that he paid hush money to a former congressional leader now in jail. Temer denies the claims. 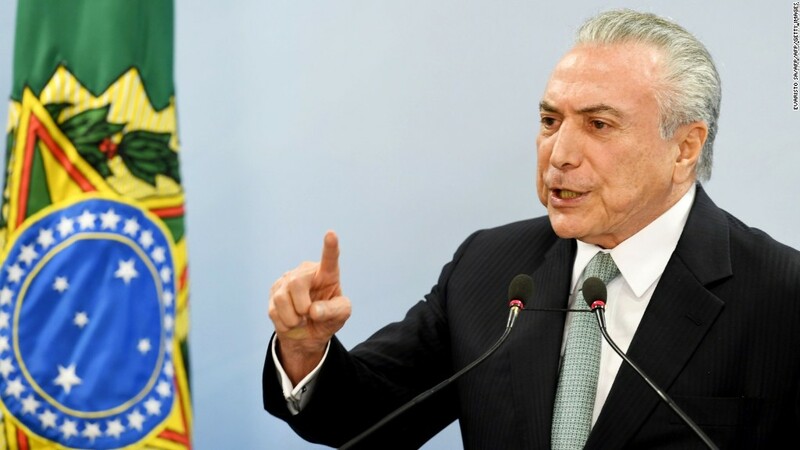 Temer's corruption allegations come one year after Brazil's Congress launched the impeachment of former President Dilma Rousseff on charges she manipulated the nation's budget. Rousseff was forced out in August. Political uncertainty is so high in Brazil, experts say the economy could dive back into recession. "If this political noise intensifies, there's a risk the economy double dips and goes back into recession," says Alberto Ramos, head of Latin America research at Goldman Sachs. "There's still very significant challenges." Ramos cautions that growth for the rest of the year may not be stellar. That's because Brazil's agriculture sector boomed at the start of the year due to an unusually large, one-time harvest. All other industries were weak. Investors hoped Temer might make much-needed changes to Brazil's pension system as he promised. But prospects for economic reforms dropped significantly with the latest revelations against Temer. On top of the political and economic headaches, more bad corporate news came Wednesday. Brazilian firm JBS, the world's largest meat packing company, agreed to pay a record high fine of $3.2 billion for its role in the country's widespread corruption scandals. JBS's fine is higher than Brazilian construction giant Odebrecht's, which got hit with the previous world record for a corruption fine. In April, a U.S. judge ruled Odebrecht must pay authorities $2.6 billion this year.